Why are some CEO blogs boring? ——- What makes a CEO blog successful? Corporate blogging – how to do it smarter. By the way, do what 5,000 other subscribers have done, sign up for our blog newsletter – it is FREE! I previously wrote two posts about this: Before you start a corporate blog, tie your shoe laces properly, and social media – ropes to skip – c-level blogs – FAQ #1. At the time I was trying to point out some of the pitfalls to beware of when launching a c-suite kind of blog. Much has changed since then and social media has come a long way. Nevertheless, blogging requires understanding one’s target audience. For instance, what do high heels and cobblestone paving, and why women buy black high heels have in common with corporate blogging? Unless you deliver what your target audience wants, you will fail. Below I outline three points every CEO or corporate blogger must remember. monitoring whether they start following you on Twitter. Still, the biggest challenge is that no amount of promises will guarantee engagement. Unfortunately, the above still may not give you the type of engagement you want. For instance, I might view a video for 13 seconds (YouTube counts a viewer as having viewed a video after only eight seconds), but then open another browser tab and do something else. Was this the type of engagement you were trying to achieve? Some CEOs such as Thomas Braunwalder of Magnetic Autocontrol (Germany) post something similar to press releases on the website and call that a blog. Unfortunately, commenting is not enabled, making it more of a broadcasting tool. less than 1 out of 1,000 people who receive your content will take the time to create new content in response (actually, it’s 0.5 people out of every 1,000). So how do I ensure that the few people that want to join the conversation do so now, and possibly in the future? In principle, engaging means joining the conversation in Xing / LinkedIn groups, replying to tweets, emails and so forth. But what else? For a corporate blog, engagement means getting readers to comment. Of course, everybody who comments wants to be heard and acknowledged with a reply and a thank-you note! How not to do it: Dr Tianyi (TJ) Jiang, Co-CEO of AvePoint lets the communication person answer when people complain about customer service on his blog. That comes across as unauthentic, no? In most cases, comments add great insights to a blog post. Additionally, replies by the author or other readers will again enrich these discussions while making the content even more interesting to your reader. 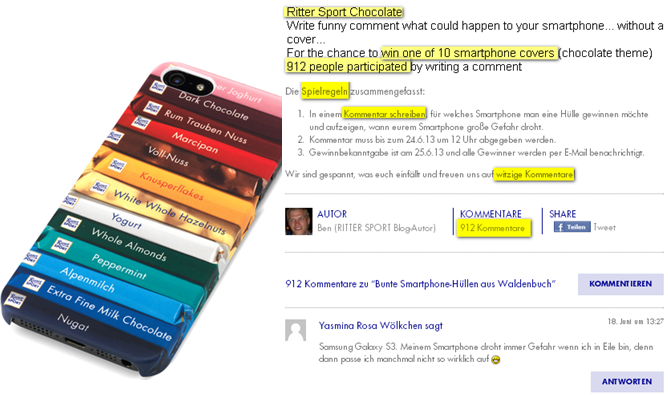 As the above RITTER SPORT example shows, offering people prizes always gets attention. Crowdsourcing consumers to provide feedback for possible design changes to product packaging will get fewer responses. This is especially true in the absence of prizes. The result is that only die-hard fans and customers comment. CEO bloggers will not want to run a sweepstakes. These are great for blogs whose content suits clients that are consumers but not industrial buyers (e.g., see RITTER SPORT). Moreover, your CEO probably does not want to be seen as pushing a product or brand down readers’ throats, as some of these blogs seem to do. Providing value with blog posts costs time. The better and more in-depth a blog post, the more effort it takes to write it – even for experts. So calculate 5 to 8 hours of writing, planning and so forth by the CEO personally for each post. This may add more long-term value to the brand than any action on Facebook or Twitter by corporate bloggers, including CEOs. Being authentic and personable is not scalable and cannot be delegated. Adding a thoughtful comment to a high quality post takes effort by the reader, so the CEO should answer. Asking somebody else to do it will not be acceptable to your readers. If blogging is done because of fashion or becomes a task and not a passion, the dreariness will also cascade into the writing. The result is another boring blog that lacks engagement! Case in point: Daniel L. Doctoroff, CEO and President of Bloomberg L.P. Source: @ComMetrics | CEO blogs: Passion, not fashion! Download Teixeira, Thales (June 2013). How to profit from lean advertising. Harvard Business Review, pp. 2-4. By the way, check out my other books that add insight to this topic. how to overcome the challenges I outlined above. His latest book, Social Media Audit: Measure for Impact, appeared in November 2012 from Springer Science Publishers. CEOs should write but it is not always easy. How to keep him going. What to do if it is stale. Yes, one of the most difficult challenges one has is to keep the CEO going as a blogger – months, years and publish her entries in regular time intervals (e.g., every months, 3rd Wednesday of the month). 3 – do a major part of the work themselves. So are we able to say yes to the above points. If not, getting a top manager or even the CEO to blog regularly for his target group will be very difficult, if not impossible. Sure, every writer needs feedback from his/her readers. feedback and you’ll get it! memorable so that your readers always recognize it. Thanks for writing a comment here. Yes agreed and as I spelled out above, the writing needs to keep one’s target audience in mind (current and potential customers). Asking one’s customer is a great tip and always works …. most of the time it is much better than asking a marketing firm to spell it out for you. If customers do not know what you stand for, we have a failure to comunicate. I think being an authentic blogger that has content that engages readers on a continuous basis is a journey, not a destination. Accordingly, its hard work, trying every single time anew and being persistent in doing a good job over years. I am still trying every day it seems and feeling challenged anew some days – what interests my readers – to produce content that is useful, solves a problem my customers worry about and adds value. novels without any computer. Readers still admire her work! What does your brand, product and / or blog stand for? For me, it is difficult to distinguish between Nike and Adidas shoes, since they both stand for winning at various types of sports. But kids identify with a player. Naturally, if he or she wears brand X…. (PS. 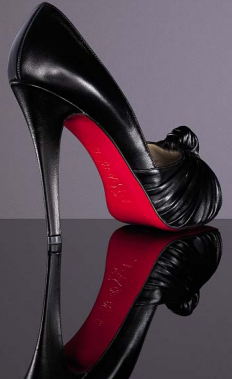 and since we change the shoes’ colors every six months, you need to purchase a new pair…. NOT). But most SMEs do not have such a marketing budget as Nike, Red Bull and / or Coca-Cola do. Hence, things are different. Moreover, if we just say our blog or product stands for value and design, it is far from being unique. Most products or brands want to stand for being unique, providing great experiences and wonderful design, etc. To illustrate further, I try to blog so that my readers want to get the tools I discuss, apply the checklists I offer and use our blog benchmark software to improve their own blogs (see image below, click on it to make it expand). Similarly, our blog benchmark software allows bloggers to improve their levels of engagement, having their content shared more on different social networks and so forth. All this helps in reaching more eyeballs of your target audience which, hopefully, helps in customer acquisition. @OlgaHenggi:twitter Thanks for sharing. So I invite you to register yourself and benchmark Your Life and Business blog – click to get summary statistics. PS. Benchmark to improve your blog’s performance click – login in it is free.